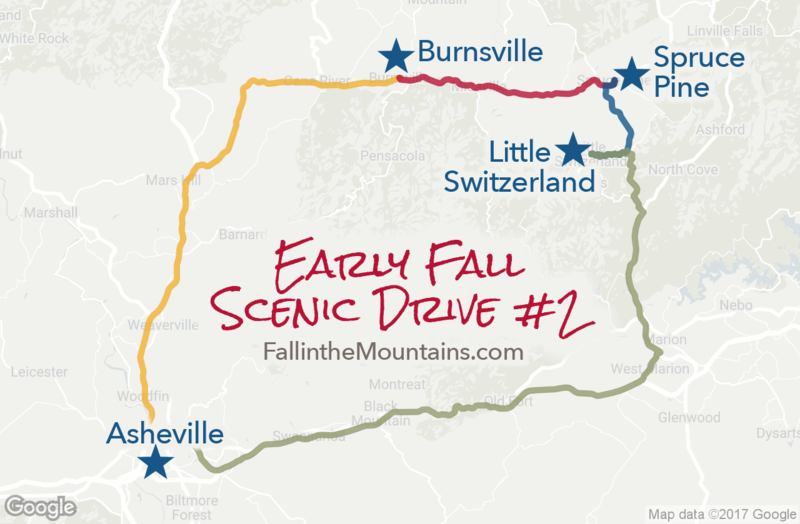 Fall Scenic Drives: Early Color | Asheville, N.C. 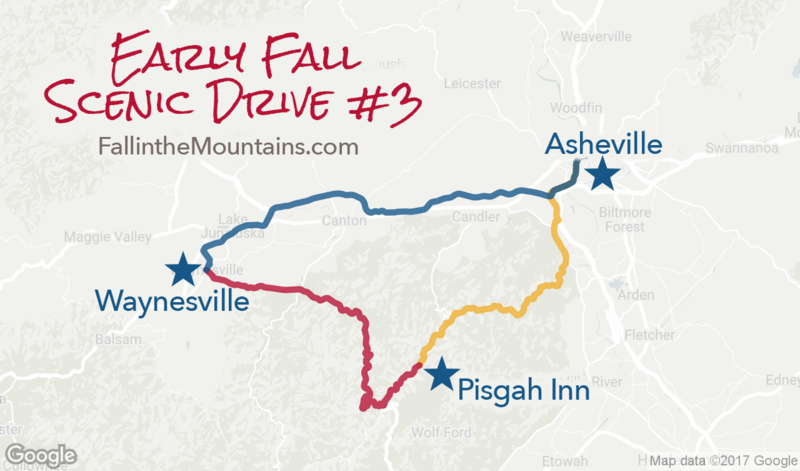 In the early fall, trees begin changing color at the highest elevations surrounding the Asheville area, so head out on these scenic drives in late September and early October. Visit our weekly fall color reports to stay up-to-date on the most colorful foliage. 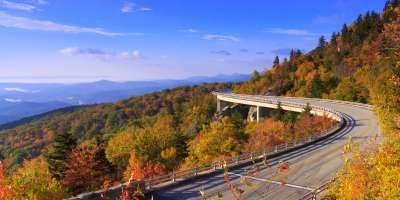 Located at Blue Ridge Parkway milepost 305, you can view native animal habitats, enjoy hiking and picnicking, and test your courage on the mile-high swinging bridge that also provides a great vantage point for viewing autumn’s rich colors. You can get to Grandfather Mountain a number of ways, and see interesting points and fabulous color along the way, no matter which route you choose. Take the Blue Ridge Parkway north from Asheville and visit Craggy Gardens on the way at milepost 364, and then marvel at the Linn Cove Viaduct (pictured above) at milepost 304. 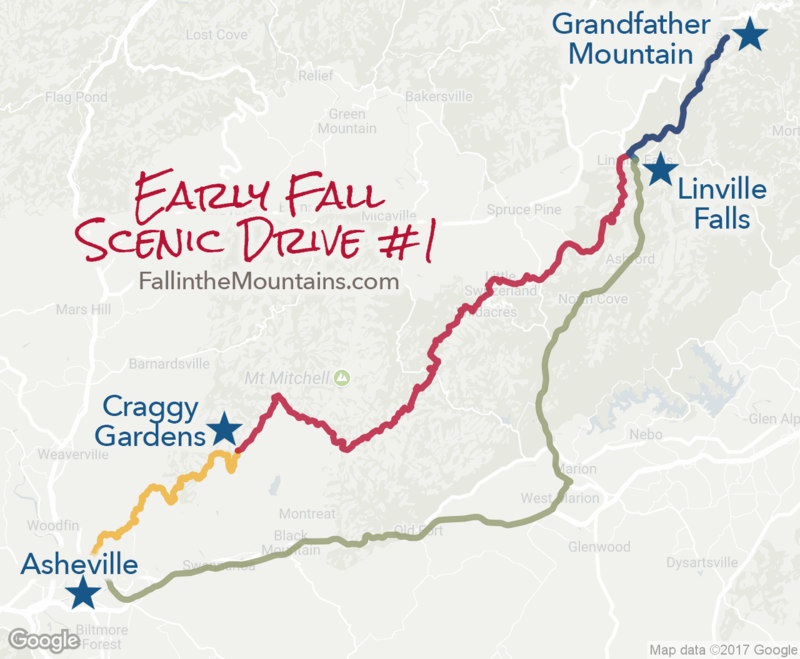 Or, take I-40 East to Marion, then Hwy 221 north to Linville Falls at milepost 316. 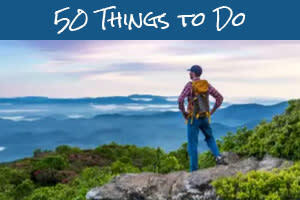 Or, take I-40 east to Morganton, then Hwy 181 north to the Parkway, passing Table Rock on the way. 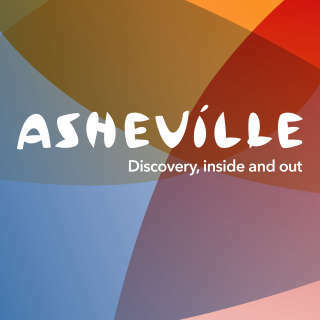 From Asheville, take US 19/23 north from downtown, and follow 19E to Burnsville. If you have time, take a break in Burnsville to enjoy its quaint shops and galleries. 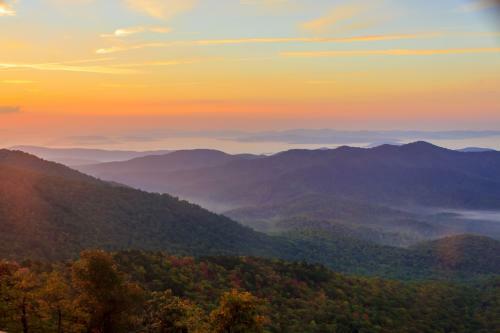 Then, continue your drive along 19E to the town of Spruce Pine, stopping along the way to visit the North Carolina Museum of Minerals and to enjoy the spectacular views of the Black Mountains and Mount Mitchell, the highest peak in the eastern U.S. at 6,684 feet. 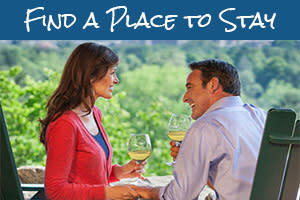 Take the Blue Ridge Parkway south from Asheville toward Mount Pisgah at Milepost 408, where you will find picnic areas, hiking trails, and the popular dining room at the Pisgah Inn, with its perfect view of Looking Glass Rock. At milepost 411, turn onto US 276 toward Waynesville. You will pass through the magnificent Pisgah National Forest, which affords a spectacular view of Cold Mountain, made famous by the novel and motion picture of the same name. Continue into Waynesville and circle back to Asheville.